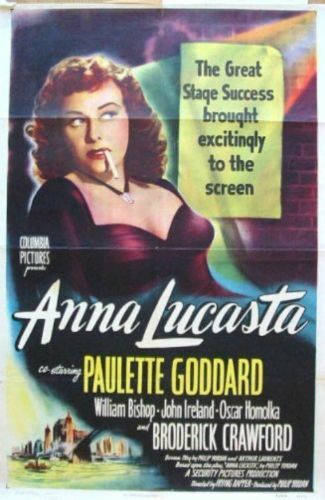 Philip Yordan's stage hit Anna Lucasta posed two problems to Hollywood in 1949. For one thing, the story concerned a prostitute who is exploited by her greedy family. For another, the characters were black, thereby cutting the box-office potential in half in those racially divisive times. In adapting Anna Lucasta to the screen, Yordan and co-scripter Arthur Laurents "laundered" the property for popular consumption. Anna's sexual hijinks are only hinted at, and in fact an impressionable viewer might even get the idea that she's still a virgin when the film comes to an end. And the racial angle was tackled by transforming the characters into Polish-Americans, which enabled Paulette Goddard to assume the leading role. Otherwise, the film differs but little from the play: Thrown out of her house by her drunken father (Oscar Homolka), Anna is welcomed back into the fold only as bait to trap an unmarried, wealthy farmer. Anna squelches her family's avaricious plans by genuinely falling in love with the poor sucker who's been targeted as her husband. Broderick Crawford fares best as Anna's doltish brother-in-law, a characterization deftly combining boorish selfishness and lovable humor. 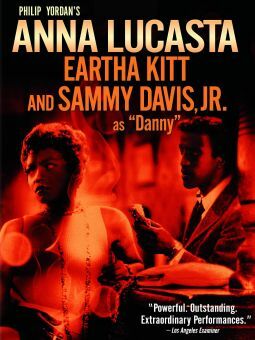 Anna Lucasta was remade with most of its Broadway bite intact in 1958 -- this time with an all-black cast.